At last a chance to cook up one of my favourite combinations. 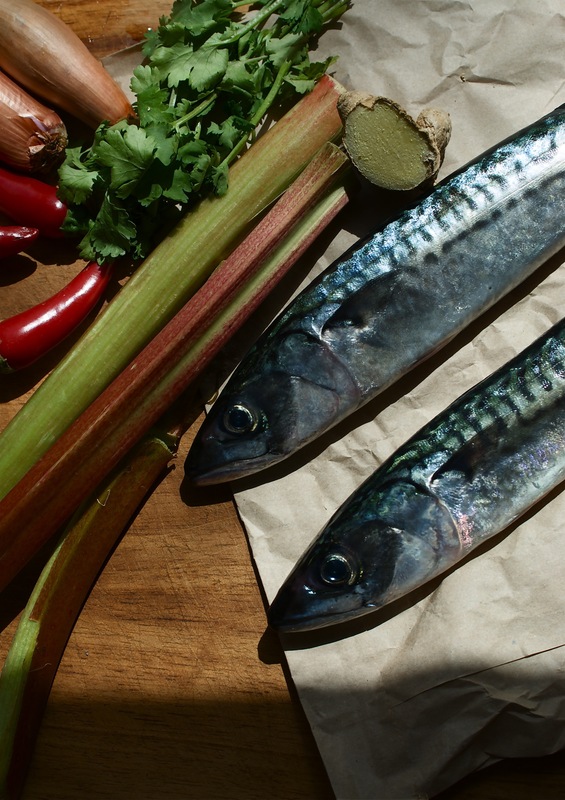 Lovely Kate gave me a huge pile of rhubarb from her garden a couple of days ago and the slightly milder weather has lured back the mackerel, they virtually jumped off the slab at the fishmonger’s this morning. So dinner was decided in a moment. Pre-heat the oven or grill to its highest setting. Line your tray with a bit of foil, to save on washing up later, & then splash on the oil. Turn the fish in the oil and then season. Set the fish aside whilst you get the sauce done. This sauce is a cinch. Just fry the shallot, ginger, chilli and star anise for about 10 minutes until slightly golden and very fragrant. Add the rhubarb, orange juice, sugar and a splash of Tamari. Simmer gently until the rhubarb is soft but still intact. If you do have a disaster and the rhubarb collapses into a stringy mess then it’s best to puree the sauce completely. Balance the sauce with more sugar or Tamari if necessary. Cook the mackerel in the oven or under the grill until just cooked through and coming away from the bone. We had new potatoes and a fresh green salad with ours this evening. Very, very nice indeed. The sauce is also stunning with pork belly and I’m up for trying it with roast duck next time around. I still had mounds of rhubarb and decided to make some cordial. I wasn’t expecting the fabulous girly-pink juice that I’ve seen in magazines since most of the sticks were rather green (and no Kate, I am NOT complaining). 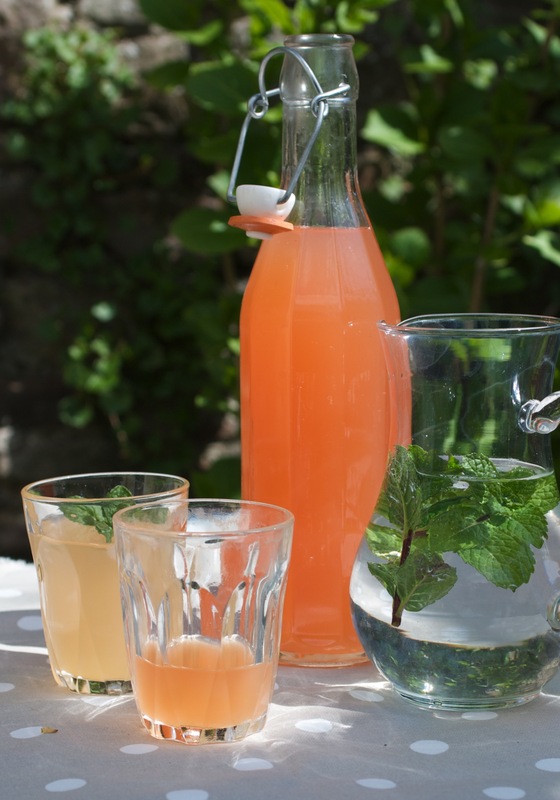 But, I have to admit to being pretty chuffed with the stunning peachy-pink of my cordial, which is good news since I think that boiling up the expensive, early forced rhubarb really would be too much of an extravagance. I’ve tinkered with my recipe a little because the cordial could do with being a a bit more intense. It really only worked at a 50/50 dilution so I’ve cut down on the water in my recipe below. So yours could come out an even more amazing colour. Fling everything in the pan and simmer until the rhubarb has just collapsed and looks rather slimy and revolting. Strain the rhubarb mixture through a sieve and resist from stirring, prodding and squashing (or you will end up with a cloudy syrup). The cordial will drip through slowly. You could leave it to strain in the fridge overnight if you have room. I never do, my fridge is a nightmare; an avalanche just waiting to happen. Bottle the cordial, keep in the fridge and use within a week. If you really do have a massive rhubarb crop on your hands you could stir in about a tablespoon of citric acid (available from shops that sell home-brewing kit) to the rhubarb just before straining and then you’ll be able to keep it for months. It’s delicious with some stem ginger syrup added too. The rather unattractive sludge left in your sieve is fantastic stirred into some Greek yoghurt for breakfast. You could even layer it in a glass with some cream/custard and crumbled ginger nuts for a simple supper dessert. 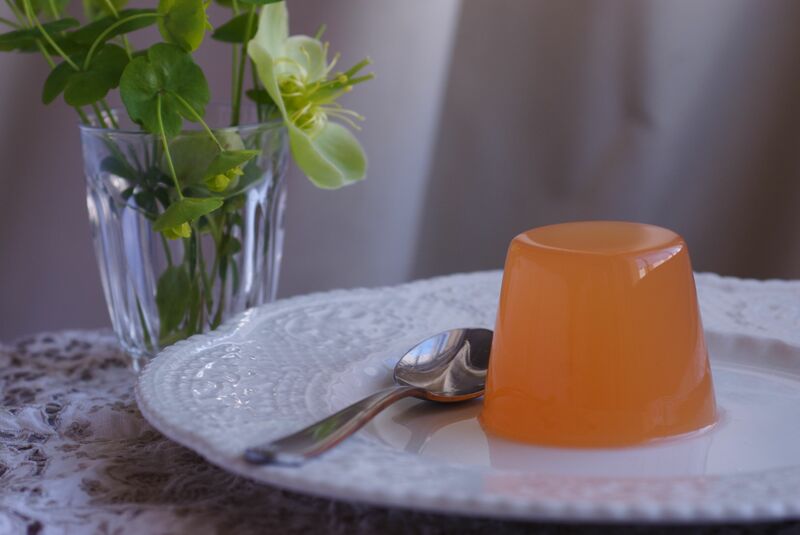 Rhubarb Jelly is fabulous using your cordial. Check the size of your dariole moulds, rabbit, racing car, other jelly moulds or perhaps you’re just using glasses. Fill up the mould with water and tip into your measuring jug and multiply by however many you’re making. Take enough sheets of gelatine to set said amount of liquid and place them in a bowl of cold water to soak. Remember not to dilute the cordial too much, your jelly needs to be much sweeter and stronger tasting than a drink would be. Heat up about 1/4 of your diluted cordial. Remove the floppy sheets of gelatine from their water, give them a squeeze and then add to the hot liquid. They’ll dissolve in an instant. Add the remaining liquid for your jelly and tip into the moulds. Leave for a few hours to set. Dip the jelly moulds into some hot water, just for as few seconds, and turn out onto plates. This entry was posted in Dessert, Drinks, Fishy Mains and tagged Cordial, ginger, jelly, mackerel, Prosecco, Rhubarb on April 30, 2013 by Jenny Chandler.